Many students neglect summer training, as they do not understand the rationale behind it. Summer training provides an excellent platform for students to gain practical experience. This practice goes beyond textbooks and lectures and enhances their their learning skills. Students are able to gain valuable insights about the industry and understand the most up to date engineering technology during their training. Besides that, students that perform well during their training are likely to receive job offers by their employer once they graduate. Each student is required to complete 40 days of summer training in a company where at least 2 electrical engineers are employed. During the training the student should make sure that the work supervisor fills out the logbook daily and conducts a formal and confidential evaluation of the student at the end of the training. The logbook which contains the daily account of the work done by the student and the work supervisors evaluation must be stamped by the company seal and it should be put in a sealed envelope to be returned to the department. In addition to the properly filled logbook the student is required to write a formal report documenting the training in the workplace. The following fall semester the student registers to the EENG403 course and two weeks earlier to the beginning of the final exams, he/she submits the report to his/her evaluator. A summer training student (STS) candidate is the student who has completed at least two of the five selective core courses (SCC) of the curriculum with a grade of D and above. It is recommended that the STS practice his/her training in a firm that works in a field that he/she is familiar with. For example, a STS who has taken the EENG 350 course is recommended to practice in the power and energy conversion area. A STS is required to complete 40 working days of summer training in a company where at least two full-time electrical engineers are employed. It is recommended that the STS completes the 40 days period in one summer however, due to some companies limitations, the training can be accomplished in two 20 days periods. Under such circumstances departmental consent is required. The STS can not take summer courses during the period of training. It is the duty of the STS to find a company for training. He/She can fill Form1 and get it signed by the committee chair to prove that he/she is eligible for training. To keep track of the STS, he/she should also fill out Form2 which conveys necessary information about the company and mail it to the department at the beginning of the training. The STS should purchase a summer training logbook from the bookstore or download it from this page (logbook) and get it filled by the training supervisor(s). The evaluated logbook should be stamped by the company and sent to the department in a sealed envelope. The STS should attend regularly the training, concentrate and act professionally. It is recommended that the STS make useful notes daily about the training and his/her observations and conclusions because these will help in writing the summer training report. The STS is expected to write a detailed report about the 40 days of summer training following the guidelines on summer training report writing (web page). The original copy must be submitted for binding. The front cover of the binding must be transparent binding plastic and the back cover of the binding must be thick hard binding cartoon. After completion of the training, the STS should register EENG403 in the following semester and get assigned a summer training evaluator who is going to evaluate the logbook and the report and assign a grade. The deadline for submission of the report and the logbook is two weeks earlier to the beginning of the final exams. It is the responsibility of the STS to contact the training evaluator and the department secretary to keep track of the modifications and corrections required by the evaluator to be done on the summer training report. Bölümümüz Staj Komisyonu’nun yapmış olduğu güncellemeler ve yeni öneriler değerlendirilmiştir. Aşağıda belirtilen kararlar alınmıştır. “40” İş gününü kapsayan stajın bir defada 40 gün veya 20’şer günlük eşit iki periodda yapılabilir. 40 days of training can be done in full or can be divided into two equal periods. 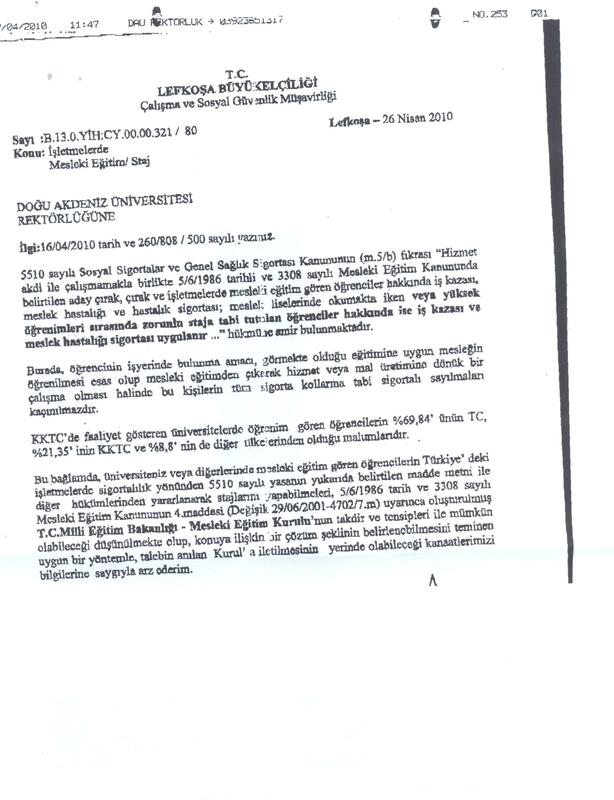 Öğrencilerin staj yapabilmeleri için en az iki Selective Core Course (SCC)’u alıp, en az “D” notu ile geçmiş olmaları gerekir. The requirement for a student to be eligible for summer training is that he/she completes two of the SCC courses with a grade of D and above. The students can do training during the semester break in December/January or August/Setember provided that there is enough time for a 20 day training period. Students who plan to attend summer school should not plan to do training during the short break after the spring semester and the beginning of summer semester. Staj için, Cumartesi gününün, staj yapılan iş yerinde Cumartesi günün çalışma günü olması kaydıyla iş günü olarak sayılmasına, Pazar günlerinin ise iş günü olarak sayılmaması gerekmektedir. Saturdays may count as a training day provided that it is a working day for the company; Sundays on the other hand does not count as a training day. Turkish students are required to get insurance. At the time a student registers for EENG403, the academic advisor is recommended to assign a suitable evaluator (group) to the student by considering the evaluator’s expertise and the student’s work in the training. c) to record and compile information about the workplace the students (in his/her group) did their training in, and submit a copy to the department. c) more than one of the criteria specified in the following table relating to the format are not satisfied. REPORT Work done by the student is described in the report. Table of contents is included. Chapters and section are properly numbered and titled.